Take Your Cat To Work Day–celebrated on June 18th in 2018–is a day to bring your favorite kitty to meet all your co-workers. It’s part of Take Your Pet To Work Week, which was started by Pet Sitters International as a lead-up to Take Your Dog To Work Day so that people who have pets other than dogs could have a chance to share their beloved pets with their work friends, too. Take Your Cat To Work Day kicks off the week on Monday. There are lots of benefits to having cats in the workplace. 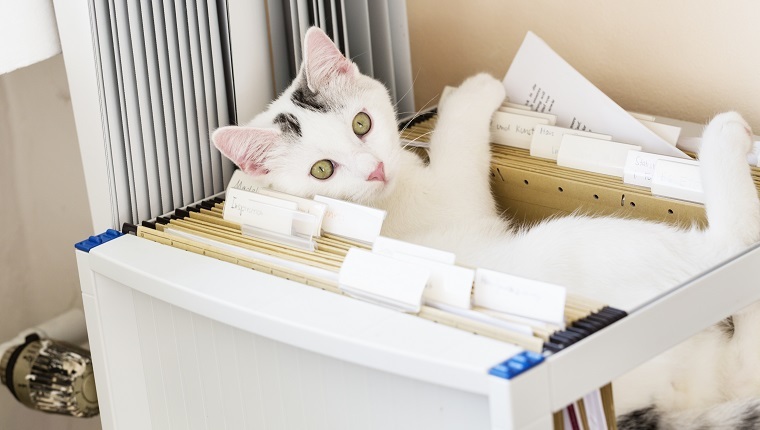 They can attract customers, reduce stress, and get rid of any pests that might show up, but before you bring your kitty into work, there are some things you should consider. Here is what you need to know to be safe and have fun on Take Your Cat To Work Day. Do NOT just show up to work with your cat if you haven’t asked for permission to participate in Take Your Cat To Work Day. Ask your boss, your HR department, or someone else who can give you the okay. There are a lot of problems that can happen when your office is not prepared for pet guests. Some employees could have allergies, some could be afraid of animals, and some could be distracted from important tasks by a pet at work. Be courteous and think of your co-workers, too. Give everyone a chance to be ready for your cat. It will be safer for humans and felines if you do. If your cat is easily startled, uncomfortable in new environments, or anxious around new people, Take Your Cat To Work Day may not be so fun for them. Also, other people may want to bring in their cats, too, so if your kitty doesn’t like the presence of other felines, problems can quickly arise. Workplaces can be busy and noisy, and people come and go, so if your cat likes to sneak through open doors, that might be another issue. Know your cat. If you are unsure of how they will do in a workplace setting, this might not be the time to test them. Don’t make your cat anxious or unsafe. Even if your cat is totally cool with new people and situations, they might feel overstimulated by all the new sights, sounds, and smells of your workplace. It’s important to give your kitty a nice place to retreat and rest so they can have a break when they need to. Make sure you have a comfortable cat carrier. You may want to bring a box, cat bed, or pillow so your cat can sit next to you and still see what’s going on. If your cat is going to be around for a full work day, bring whatever they’ll need for several hours away from home. You’ll need a bowl for water, food if meal time happens while you’re at work, treats, toys, and any medication your cat might need. You’ll also probably need to have a litter box or some other way to let your cat go potty so you can dispose of waste properly. Making new friends can be a lot of fun if it’s done on your cat’s terms. Have your co-workers let your cat sniff before they pet. Give your co-workers treats and toys so they can show your kitty that they come in peace. If your cat seems uncomfortable, let them take a break and try introductions again when they are feeling less overwhelmed. Don’t introduce everyone all at once. Take things slow. Let your cat warm up to new people on their own time so they can have fun on Take Your Cat To Work Day, too. Are you planning to bring your cat to your workplace on Take Your Cat To Work Day? What other tips would you recommend for people who plan to take their cats to work? Let us know in the comments below!